So Saracens are top of the Premiership, now eight points clear of second-placed Exeter, while Wasps did their top-four aspirations no harm at all with their win at Bath. 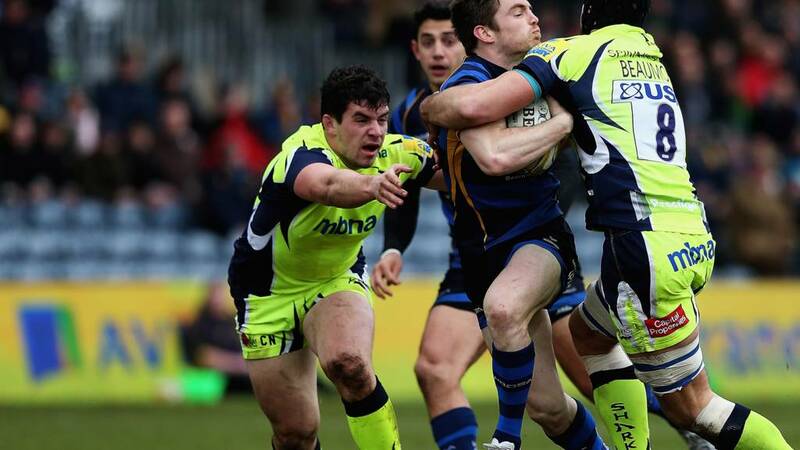 And congratulations to Worcester, who ended a long, long wait for a victory by beating Sale. Thanks for your company today. We'll see you again tomorrow. England and France take their 100% winning starts into the third round of Six Nations fixtures next week. France are in Wales on Friday - a game you can watch live on BBC One - while on Saturday it's Italy v Scotland and England v Ireland. All three games are live on BBC Radio 5 live and 5 live sports extra, while you can catch up with the highlights on Sunday at 19:00 GMT on BBC Two. That's four out of six games wrapped up for the weekend. However we're back with you tomorrow with a double dose of Premiership action to go with your Sunday roast - both games kicking off at 15:00 GMT. A fifth successive win for Wasps for the first time in this competition since the 2012-13 season. It's another defeat for Bath, but they do come away with the losing bonus point. And Bath get that losing bonus point score from a catch-and-drive. Japan international Amanaki Mafi the man who touches it down after the maul rumbles over. Tom Homer off target with the conversion. Final minute at The Rec. Bath have a line-out on Wasps' five-metre line for a consolation try. As mentioned earlier, Bath centre Ollie Devoto was also taken off at half-time at The Rec with concussion which could rule him out of the match against Ireland next week. Bath going in search of a score here in the final three minutes to claim a losing bonus point. Wasps back to full strength with the return of Thomas Young from the bin and they are sniffing a bonus point try to go with a fifth win in succession. Big burst to the Bath line by Christian Wade, showing all the pace that we know he possesses. He's brought down 10 metres short. Wasps shift it left, but they spurn the fourth try as Charles Piutau's pass to Frank Halai is fumbled. Should've been a hat-trick for the winger in the closing six minutes. Into the last 10 minutes at The Rec and Wasps have got some of their earlier lead back after Ross Batty is penalised for coming in at the side. Bit of a delay before Jimmy Gopperth kicks the three points as captain George Smith seems to have had the decision taken out of his hands. He wanted to go for the corner, but referee Tom Foley says the tee was already bought onto the field. Worcester's 13-game, four-month wait for a win is over! Three tries and a 16-point haul from fly-half Tom Heathcote has secured four points for Dean Ryan's side who are up to 10th. Sale take a try bonus point after scoring four tries. An immense second-half display from a 14-man Saracens side sees them bounce back from that huge loss to Wasps last week with a gritty victory over Gloucester. Ben Ransom grabbed the game's only try inside four minutes and while Schalk Brits saw red on 29 minutes, the Premiership leaders came up with a memorable win thanks to six penalties from Charlie Hodgson and a huge display from the Sarries pack. Last 15 minutes and Bath have finally woken up in this one. Aided by an earlier yellow card to Thomas Young, they capitalise on the man advantage and Tom Homer runs on to Matt Banahan's grubber just in time. Homer then adds the extras to his own try off the tee. Surely that is game done now. Charlie Hodgson lands a sixth penalty for Saracens with three minutes remaining at Allianz Park. Mike Haley's burst into the line and crashes over for Sale for his second of the afternoon. Just over three minutes left and Worcester are heading to a first win in 13 games as Nick Schonert jogs on so they have a full complement of 15 men. Sale's best hope is a losing bonus point - a fourth try will give them another point too with a try bonus. That could well be that at The Rec. A third try of the afternoon for Wasps through prop Simon McIntyre. Jimmy Gopperth the man who engineered it originally and his offload to Christian Wade almost led to the score, but after he was held up, McIntyre was there to put it down. Nine minutes remaining and Saracens have their biggest lead of the contest, Charlie Hodgson sending a fifth penalty through the sticks. A staggering display at scrum time has been the key to this second-half performance against Gloucester. Remember, this is a Saracens side that have been a man down since the 29-minute mark. Bath so close to getting the try that would've pulled them right back into this one. Jimmy Gopperth wrestles possession back for Wasps from five metres out and the visitors can break clear quickly back up to halfway as we enter the final quarter of this one. Sale, with the man advantage, were unable to nudge over from successive scrums as they piled pressure on the Worcester try line. The Sharks spin it out to the backs but it results in a knock-on and Worcester have a relieving scrum where they will hope to get the ball upfield.